In order to make this program as accessible as possible, 4 free spots are available per workshop session for those who are not in a financial position to make a donation. Those interested must complete the online registration process in advance of the workshop date to claim a bursary spot. 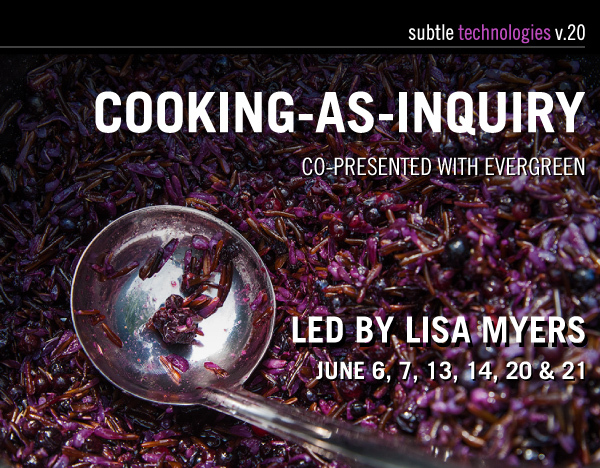 This series of culinary workshops is a collaboration of the food scholars, artists, food advocates and cooks from Indigenous communities around the province who will gather virtually through technology and in-situ. Through cooking and discussions of wild rice (manoomin) these workshops will build an understanding of the complex network of relations from which this featured ingredient emerges. The workshops will present food’s capacity to connect people with places, history and a sense of belonging while thinking through issues of power relations related to food access and cultivation. Inspired by the idea of cooking-as-inquiry this series values learning by cooking with the cooks around us, and the generations that came before. Seasonal ingredients for these workshops will be purchased from participating indigenous communities to directly support their economies and highlight issues of food security. Workshops in Week One will include cooking manoomin (wild rice) while sharing and learning about experiences of harvesting and processing this important food. Media artist and musician Melody McKiver will tune in through video conferencing from Sioux Lookout, Ontario (Treaty #3), to share her experience harvesting wild rice. Manoomin cultivator and advocate James Whetung, from Curve Lake First Nation, will talk about his work with wild rice around the Kawartha Lakes region. During each workshop we will be joined by different community members from around Ontario via teleconferencing technology in the kitchen. Workshops in Week Two include cooking manoomin (wild rice) and considering wild rice flour. We will welcome James Whetung from Curve Lake First Nation into the kitchen to talk about his history of ricing in central Ontario. On Wednesday, artist and bannock champion Peter Morin will tune in through video conferencing from Brandon, Manitoba (Treaty #1) and together with chef of Pow Wow café, Shawn Adler, they will discuss bannock in different forms and wild rice as Indigenous foods. During each workshop we will be joined by different community members from around Ontario via teleconferencing technology in the kitchen. Susan Blight will join the workshops on Week Three as we cook manoomin (wild rice) and discuss the important role of manoomin as food and its role in governance. During each workshop we will be joined by different community members from around Ontario via teleconferencing technology in the kitchen, including wild rice scholar, Jana Rae Yerxa, hailing from the manoomin ricing community of Couchiching First Nation in Northwestern Ontario. Melody McKiver is an Anishinaabe musician and media artist and is a member of Obishikokaang Lac Seul First Nation. They are passionate about manoomin, and learned traditional manoomin harvesting in the Ottawa Valley through three years of trial and error. Melody moved to their homelands of Sioux Lookout in 2016 and continue harvesting in northwestern Ontario while reaching out to Elders and knowledge keepers for further teachings. Melody has performed internationally as a solo and collaborative violist and composer. They live in Treaty #3 territories in Sioux Lookout ON and are currently employed as the Field Coordinator for the Indigenous Reporters Program by Journalists for Human Rights. They hold an MA in Ethnomusicology from Memorial University (2014), and a BFA in Music from York University (2010). James Whetung, from Curve Lake First Nation, is the owner/operator of Black Duck Wild Rice. He has over 25 years of experience in collecting and processing Manoomin. James was trained in this by his Elders and holds an immense amount of traditional knowledge on Manoomin collection and processing methods. James offers educational workshops and talks for groups and schools. Annually, he leads canoe groups on excursions into the wild rice beds of the Kawartha Lakes, the traditional ricing area of the Mississauga First Nation. Peter Morin is a Tahltan Nation performance artist who studied art at the Emily Carr Institute, completed his MFA at UBC Okanagan, and currently teaches with the Visual and Aboriginal Art Department at Brandon University. Morin’s artistic practice and research investigates the impact between indigenous culturally-based practices and western settler colonialism. He has exhibited and performed widely in Canada and Internationally. In 2009, Morin compiled a book titled Bannockology: A Community Collaboration of Stories, Art, Essays, Recipes and Poems Initiated by Liard Valley Literary Society. Shawn Adler is a member of Lac des Mille Lacs First Nation, which is located northwest of Thunder Bay. His mother is an Anishinaabe-kwe and his father is a Polish Jew. He has two older sisters and two younger brothers. He has been cooking professionally for 22 years and owns Pow Wow cafe in Kensington Market (Toronto), which specializes in pow wow style food with an emphasis on Indian tacos and Indigenous ingredients. Adler is a graduate of Stratford Chefs School and Trent University’s Native Studies program. He enjoys long walks on the beach, baseball, hard work and his family. Susan Blight is Anishinaabe from Couchiching First Nation. Susan is co-founder of The Ogimaa Mikana Project, an activist collective working to reclaim roads and landmarks with Anishinaabemowin and is a member of the Indigenous Routes collective which provides free new media training for indigenous youth. Susan received a Masters of Fine Arts from the University of Windsor, a Bachelor of Fine Arts and a Bachelor of Arts from the University of Manitoba. She is a Presidential Appointee to the Hart House Board of Stewards, co-chair of the Indigenous Co-curricular Education sub-committee of the University of Toronto’s Truth and Reconciliation Steering Committee, and a recipient of a 2014 IDERD award for her anti-racism work at the U of T.
This project is supported through Toronto Arts Council Strategic Funding.